Hi everyone. I’ve been fiddling about with Pinterest recently, the most aesthetically pleasing time-vacuum that has ever existed, and I’ve stumbled over several efficiency-boosting and general goddess-home-maker resources for Mums. There are 20 ways to organise your work desk, 15 ways to make your kids’ organic lunch sushi look like an anime panda and 101 ways to kid yourself that green tea is a pleasurable Diet Coke replacement. It’s another world. Anyone who has met me will know that I am a veritable fountain of organisation, demure housewife perfection and general Pinterest-worthiness, so I thought I’d share some of my own charm-laced wisdom here. Today, it’s 10 ways to wake yourself up in the morning after being woken eleventy gazillion times in the night by your kids (or any kids, but hopefully yours.). Start each day with a glass of warm water with a squeeze of organic lemon, a kale smoothie and three crushed caffeine pills snorted through a straw. 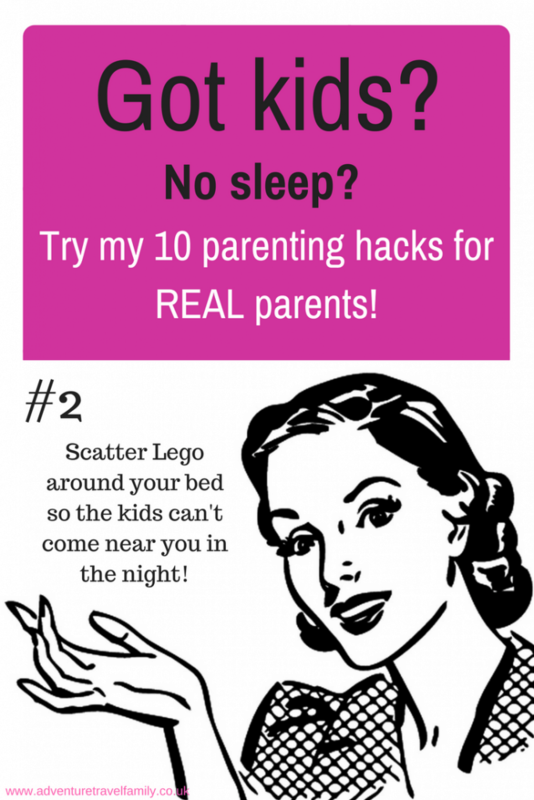 Scatter a kilogram of Lego around the floor of your bed to create a barbed-wire-esque border to prevent small people from coming near you at night. Even if this doesn’t work to get you a peaceful night’s sleep, stepping on it when you wake up in the morning will have you going from bleary-eyed to bright screeching consciousness in no time. Keep a bottle of Diet Coke and a small funnel next to your bed. Refuse to answer any requests for 3am drinks, removal of microscopic spiders or general chit-chat until child has poured sufficient amount of caffeine down your throat. Set your phone alarm to the Peppa Pig theme tune (on repeat, of course) and put it on the highest possible volume, then place it downstairs. You will only be able to stay in bed for so long before you crack at the torturous tunes tinkling into your nightmares. Alternatives include Bob the Builder or the noises from the characters in In The Night Garden. Pure masochism. Go to bed fully dressed and with a full face of make up, leaving you to only baby-wipe any smudges from under your eyes in the morning. Efficiency game level = expert. Make sleep completely unappealing by co-sleeping with your toddler and be sure of a foot-in-the-face wake-up call every 30 minutes. Ensure you only keep healthy snacks in your handbag such as a portion of 6 organic unsalted almonds or two thirds of a celery stick- extreme hunger will keep you alert and on edge, ready for whatever the day throws at you. Download ten 30-minute videos of Peppa Pig from YouTube on your phone and make a playlist with them all together. Hand your toddler the phone; they will play one after the other automatically. It’s nap time for you. You’re welcome. Prepare absolutely nothing for the morning; a frantic shouty hunt around the house for shoes, book bags, pieces of toast and hairbands is sure to get that adrenaline pumping for a super productive day. Sleep in another house. Preferably one that has no other people in it, although any child-free building would work. Come to think of it, if it’s a toss-up between a night in an abandoned car under a railway bridge or being poked every 50 minutes by a child with a question about evolution / a wee-soaked nappy / a nightmare about Attack Squids / a “fun fact” about the surprisingly bird-like sound that a cheetah makes, I’ll take the car. I hope you enjoyed my tips for winning at life with kids; I’d love to hear if you have any similar tips for surviving the sleep-deprived years? (It is only a few years, right… tell me it ends..?) Check out another parenting humor post, a real day in the life of a travelling family, here. Norwegian Air Dreamliner Review: We Don't Mince Words!